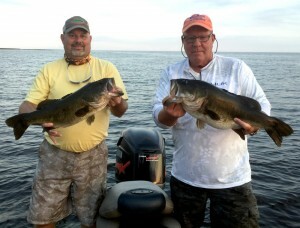 www.okeechobeejust4bass.com (910) 330 9821 fishing with Ron Harris and Byron Barnard. This was a 3 day split day charter 4 hours in the morning and 4 hours in the afternoon until dark. Here is a picture of the 2 biggest fish of the charter.